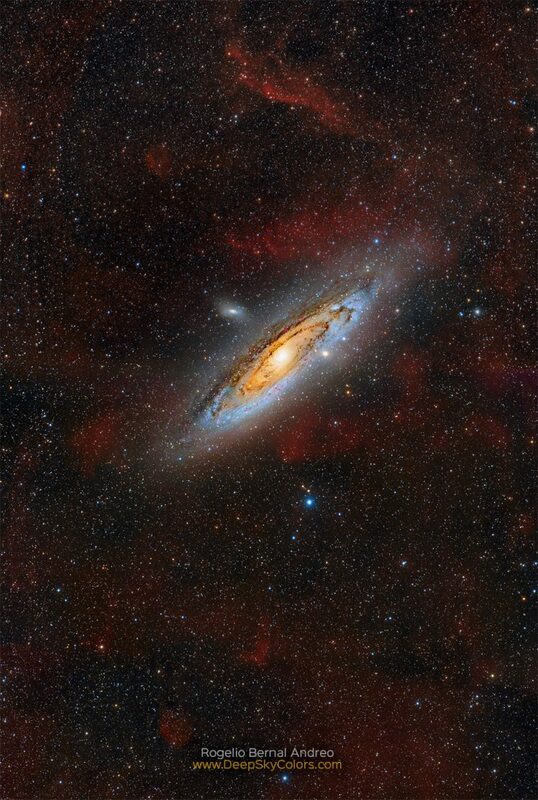 Explanation: The beautiful Andromeda Galaxy is often imaged by planet Earth-based astronomers. Also known as M31, the nearest large spiral galaxy is a familiar sight with dark dust lanes, bright yellowish core, andspiral arms traced by blue starlight. A mosaic of well-exposed broad and narrow-band image data, this colorful, premier portrait of our neighboring island universe offers strikingly unfamiliar features though, faint reddish clouds of glowing ionized hydrogen gas in the same wide field of view. Still, the ionized hydrogen clouds likely lie in the foreground of the scene, well within our Milky Way Galaxy. They could be associated with the pervasive, dusty interstellar cirrus clouds scattered hundreds of light-years above our own galactic plane. If they were located at the 2.5 million light-year distance of the Andromeda Galaxy they would be enormous, since the Andromeda Galaxy itself is 200,000 or so light-years across.